Image from OK Jim's Eggroll Emporium. To provide your gardens with life-giving nitrogen, forget about buying chemical fertilizers. There are endless composting options that will allow you to give your plants all the nourishment they need—without the nasty effects of chemical runoff choking the life out of estuaries, streams, and rivers. Fertilizer plant explosion in West, Texas. Image from ABC News. Yesterday's explosion at a fertilizer plant in Texas is akin to devastation wrought by pipes bursting during oil extraction or the disastrous side effects of fracking. In our manic attempts to artificially grow super-crops, live in unnecessary luxury, and pay more heed to money than common sense, we're causing untold damage to the Earth's ecosystems—and, inevitably, to ourselves. Anytime we pack hundreds of tons of ammonium nitrate into a factory to make chemical fertilizer, we're putting lives at risk. Anytime we run pipelines to transfer oil, we're risking the health and well-being of animals, crops, and people. But let's get off the soapbox and spend a few minutes exploring ways to take matters into our own hands. Growing your own food removes your need for Big Agriculture. By creating your own beds of greens, veggies, and even fruit trees, you're taking yourself out of the monster machine that large-scale agriculture's become. So if you're making that move, why not ensure that in your small microcosm, the run-off from your backyard isn't going to contribute to any pollution or sickening runoff? First, let's consider the two biggest culprits of unhealthy backyard gardening: pesticides and fertilizers. PESTICIDES: The EPA estimates that approximately 74 million pounds of pesticide active ingredients (7 percent of total conventional pesticide use in the United States) are used in homes and gardens each year. Pesticides are either applied by commercial pest control and landscape maintenance companies or by homeowners themselves. Studies have shown that pesticides can be extremely unsafe, particularly when they run off into waterways, which can cause short- and long-term damage to people and the environment. Pesticides can also inadvertently kill living things that they are not intended to. As a whole, pesticides do provide some benefits, but they are also known to harm the environment and the plants and animals that it contains. When a pesticide leaches through the soil where it is applied, it can end up in the water table. In waterways, millions of fish are killed by pesticides each year, and other aquatic life also suffers the consequences of pesticide-contaminated water. Pesticides are also known to add to air pollution as a result of pesticide drift, and some even play a role in harming the ozone layer and contributing to global warming. Additionally, pesticides have a resistance to breaking down over time, meaning that their effects can continue over a long period of time. FERTILIZERS: (From Jerry Greenfield) Chemical fertilizers promote quick growth in plants, which can prevent them from developing a good root growth, strong stems, or nutritious fruits and vegetables. Plants will sprout quickly, but what you'll end up with will not be worth much. Chemical fertilizer is usually high in nitrogen salts, and if the nitrogen is absorbed by soil too quickly, it will end up dehydrating the plant, causing it to dry up and die. Chemicals in man-made fertilizers will harm and eventually kill the natural microbes found in your soil. These include beneficial insects, fungus, and bacteria naturally found in your soil. These "creatures" are all naturally occurring and necessary for healthy soil and plant growth. Obviously applying chemicals to your plants and soil will affect these organisms. Chemicals in synthetic fertilizers will eventually, and unavoidably, end up leaking into our environment's water supply. It will be consumed by wildlife and can have short- and long-term effects on them—just like it would if we were to ingest these chemicals. Finally, let's think about the fact that we are going to eat these plants. If we are saturating the soil they grow in with chemicals, and then feeding the plants and treating them with chemicals (pesticides, herbicides, fungicides), how can we possibly think these fruits and vegetables are healthy for us to eat? What is the point of growing our own food if we're just going to poison it before eating it? All organic matter is made up of substantial amounts of carbon (C) combined with lesser amounts of nitrogen (N). The balance of these two elements in an organism is called the carbon-to-nitrogen ratio (C:N ratio). For best performance, the compost pile, or more to the point the composting microorganisms, require the correct proportion of carbon for energy and nitrogen for protein production. Scientists (yes, there are compost scientists) have determined that the fastest way to produce fertile, sweet-smelling compost is to maintain a C:N ratio somewhere around 25 to 30 parts carbon to 1 part nitrogen, or 25-30:1. If the C:N ratio is too high (excess carbon), decomposition slows down. If the C:N ratio is too low (excess nitrogen) you will end up with a stinky pile. Below are the average C:N ratios for some common organic materials found in the compost bin. For our purposes, the materials containing high amounts of carbon are considered "browns," and materials containing high amounts of nitrogen are considered "greens." Note: Many ingredients used for composting do not have the ideal ratio of 25-30:1. As a result, most must be mixed to create "the perfect compost recipe." High C:N ratios may be lowered by adding grass clippings or manures. Low C:N ratios may be raised by adding paper, dry leaves or wood chips. Your compost is going to act as a wonderful fertilizer for your plants. That, used in tandem with crop rotation and natural bug deterrents (and attractants!) will ensure a healthy garden for years to come. 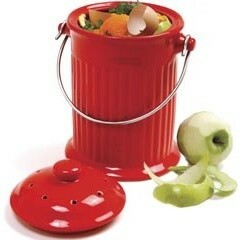 Plastic bin from Great Green Gadgets. Metal compost bin from Natural Home Merchandise. Ceramic compost bin from st.houzz.com. Backyard compost can come in a heap, a bin, a barrel, a pallet cube, or can simply be put directly onto your garden beds (as we often do in our mulch gardens). Some of the most popular outdoor compost tumblers are plastic, which causes some concern for those concerned about toxins leeching out of the plastic as the compost heats up inside. There are no conclusive tests on the subject thus far—probably in part because compost doesn't get hotter than about 160 degrees—but for those of you who are weary, there are plenty of other options besides those plastic tumblers. Wooden compost bins are readily available online (click here for some examples), but for significantly less you can make your own (check out these directives from Instructables). And for those of you out in the country, a simple wire-mesh enclosure will do the trick (to turn your compost every few months, just rake out the pile, move your stakes, and shovel out the black earth at the bottom). But you can also use old bureaus, old fencing, or any other design you can dream up. Most important is that you're able to turn the food scraps, and that they receive ample amount of aeration for good decomposition. Share your compost design ideas with us at info@betterfarm.org.